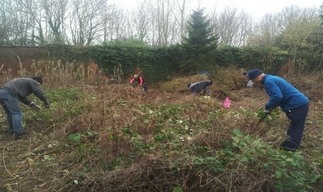 Our first volunteer day was on 22nd January when 30 volunteers gathered and started to tackle the overgrown jungle that faced us. 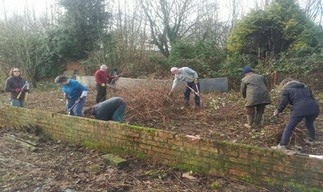 Huge quantities of brambles and nettles were cleared and by the end of the day the walls were becoming visible and an enormous amount of undergrowth had been cleared. 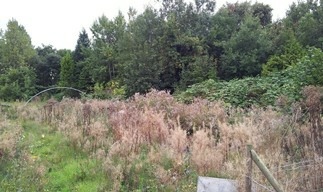 Clearance work continued on the dense undergrowth and the very many shrubs and trees growing in the garden. 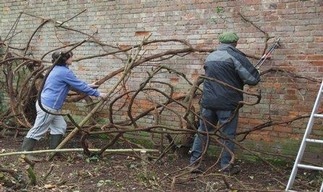 Volunteers were tackling the thick ivy growing on all the walls - on both sides; collecting broken glass from old 1960’s greenhouses around the site; demolishing modern walls and pulling up old barbed wire fencing. 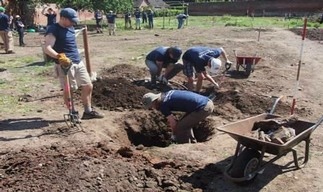 Clearance work was still the main focus of all volunteer days. There were still many shrub and tree roots to be removed and various low brick walls from modern 1960’s structures to be excavated. Volunteer hours already amounted to 500 by the end of the month. We cleared and dug a piece of ground and planted our very first crop - potatoes - so the garden now entered a new era. The huge grapevine on the east wall was cut back, and work continued on clearance of the ivy from the walls. Plenty of clearing, digging and weeding still to be done. 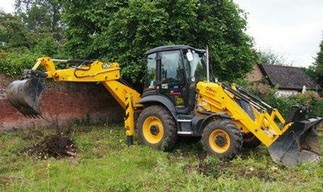 The building contractors O’Brien’s very generously came for several days with their large machinery to remove tree stumps and the remains of modern brick structures from around the site. This helped our clearance work enormously. 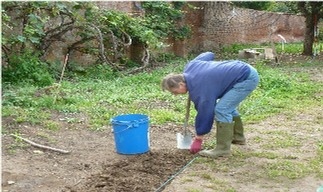 Defining the paths and beds for the walled garden continued throughout the month. 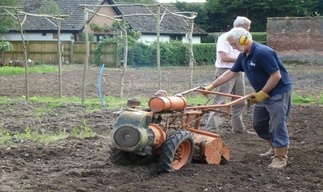 At the end of August we were lent a rotovator and work started on rotovating all the newly marked out beds. This was a job for the more physically robust volunteers, and made an enormous difference, saving many hours of hand digging. 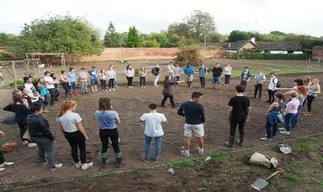 90 young people, from the National Citizen Service Challenge Programme, came to the garden over two enjoyable days and completed a range of useful tasks eg, building compost bins, siting some espalier posts & levelling paths. 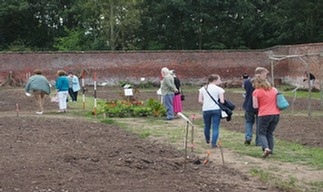 We had a very successful Open Day, as part of the Heritage Open Day scheme, with 400 visitors. 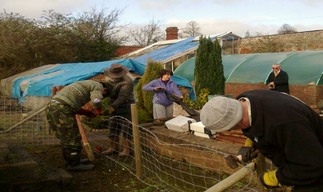 National Grid had a community service away day at the garden. They built some prototype pergolas, helped trace the underground water pipes and cleared the timber from behind the west wall. 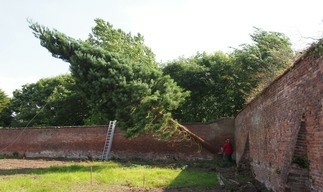 A large Wellingtonia tree in the SW corner, damaging the wall, was felled. 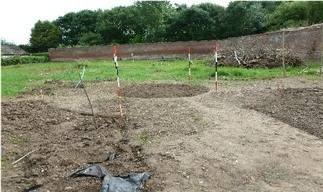 We began to mark out the pathways around the garden, following the 19th century records. 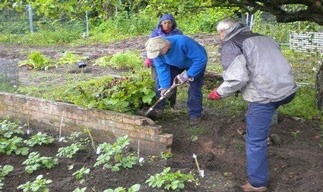 More clearing, digging & weeding throughout the month. A particular problem in the walled garden is an abundance of horsetail, which is a very deep rooted invasive perennial that spreads quickly and forms dense mats of 2’ high foliage. On one volunteer day we experimented making it into a hair tonic. 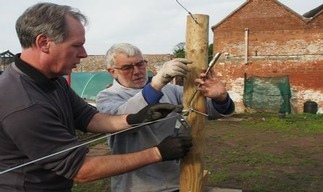 More lines of espalier posts were completed and the team became expert in ‘haywire twist & barrel roll’ knots for the wiring. 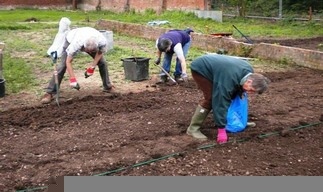 Some winter crops of broad beans, cabbage, onions and garlic were planted. Generally clearing the site continued. Many concrete blocks just underneath the surface continued to be found and had to be dug out. 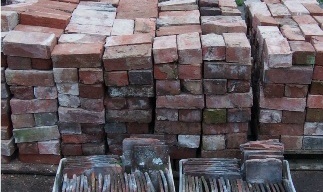 Over several days, volunteers salvaged more than 1200 bricks from a derelict building in Barford on the old Sherbourne Nursery site. 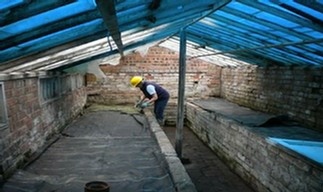 Dating to around 1820, they are compatible with some of our bricks so will be useful for our renovation work. Volunteers celebrated the end of a most successful year with mulled wine and mince pies. 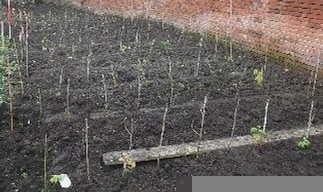 Over 100 raspberry canes were planted in the side borders this month. 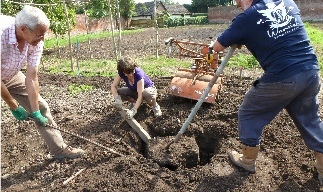 Our first 18 fruit trees arrived and were heeled into a temporary bed, ready for planting into position early next year. 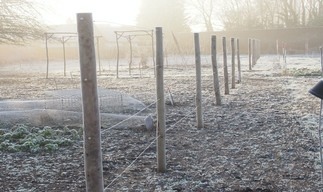 We capped the walls with heavy duty polythene to keep out the worst of the rain & frost. 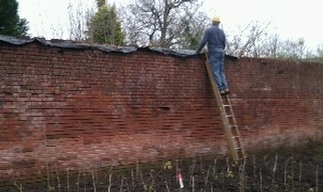 Ironically, now the ivy has been removed they are more vulnerable to damage until the capping is renovated.